If you suddenly discover something wrong with your garage door system, don't try to take care of it yourself. This mechanism can be extremely dangerous when mishandled. Unless you have the experience and the professional training needed to solve problems like broken springs and damaged motor gears safely, you need to let our highly skilled technicians handle things. 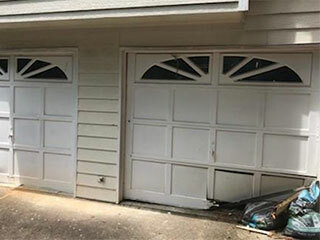 DIY repair is the number one cause of accidents involving garage doors, so we urge you not to go that route and instead give our team a call. Did your door suddenly get stuck partly open? There may be something wrong with its tracks. These components tend to accumulate all sorts of debris, and they can also become bent, dented or misaligned, which can cause your door rollers to slip out. Our technicians will assess the situation, fix any damage they discover, and replace worn-out parts that prove to be beyond repair in order to ensure that your door can once again open and close smoothly. One of the most common problems garage door owners face is a spring that broke all of a sudden. Trying to open the door after that happens can be very difficult, not to mention, dangerous. The task of replacing this type of component is risky enough as it is, due to the high amount of tension involved in the process. Luckily for you, our technicians are experts at carrying out this type of work, and we can safely replace or adjust both torsion and extension springs. If you find yourself unable to close your door all of a sudden, there may be an issue with your opener's safety sensors. These photo electric eyes must be perfectly aligned, and if they malfunction, they may be experiencing a 'false-positive', which means they mistakenly detect an obstacle in the door's path, even though nothing is actually there. Count on our team to quickly troubleshoot your opener and find the best solution for the problem. We can even replace the safety sensors altogether, if that's what's called for. There's no need for you to try and work out the solution to the problem you're experiencing. That's what our team at Garage Door Repair Glendora is here for. Remember, all the help you need is just a phone call away.